Whilst the inbuilt buttons for the menu are great, it would be nice to have more of them for some extra choice when creating menus, the buttons are easy to use, I would just like to see more of them! Plenty of options to play with the included buttons, but more designs would have been nice. Whilst it is very easy to create a DVD in DVDStyler, it sometimes can be a little slow in rendering and burning the DVD, obviously there are always going to be limitations compared to commercial software, however it would be nice if that aspect of the program could be altered in the future. This one is both a pro and a con depending on who the user is. Yes, as we mentioned above, the ease of use makes this software very beginner friendly, however, for more advanced users DVDStyler may not have enough options to satisfy, perhaps adding some advanced options later could be a way to remedy this. DVDStyler is restricted to only two audio format options, something very much in contrast to the video compatibility which is very extensive indeed. Adding in other audio formats could be a great way to improve the software in future iterations. DVDStyler comes with ad support that offers to install a toolbar during the installation process. Whilst there is nothing wrong with this at all, you can opt to not install it and the software works just fine regardless, it is something to consider when downloading. * Customize DVD with free DVD templates and DVD parameters like Aspect ratio, TV standard, quality, etc. * Edit videos with the advanced video editing functions like trimming, cropping, adding watermark, subtitles etc. Interface Not intuitive Clear with four tabs: "Source", "Menu", "Preview" and "Burn". File Browser List on the left of interface and easy to find the files Click the "Import" icon to open folder to add files. Ads You need to opt to not install it when installing. Totally clean. No virus, no adware, no spyware, and no malware. Support DVDStyler is an open source software which do not have the support team. Once you are in trouble, you need to go to their forum to looking for help. But with EaseFab DVD Creator, you will get the professional and perfect service to fix your problem anytime via a special customer service team. All in all, if you're looking for a free DVD authoring tool to make DVDs, DVDStyler will be the one of best choices. It's the app with the large number of DVD customizing freatures, a wide range of video/audio input formats, can embed subtitles and let you design your own custom menus. If you're looking for a simple, stable, fast DVD burning tool with advanced editor and timely support, EaseFab DVD Creator will be your best choice. 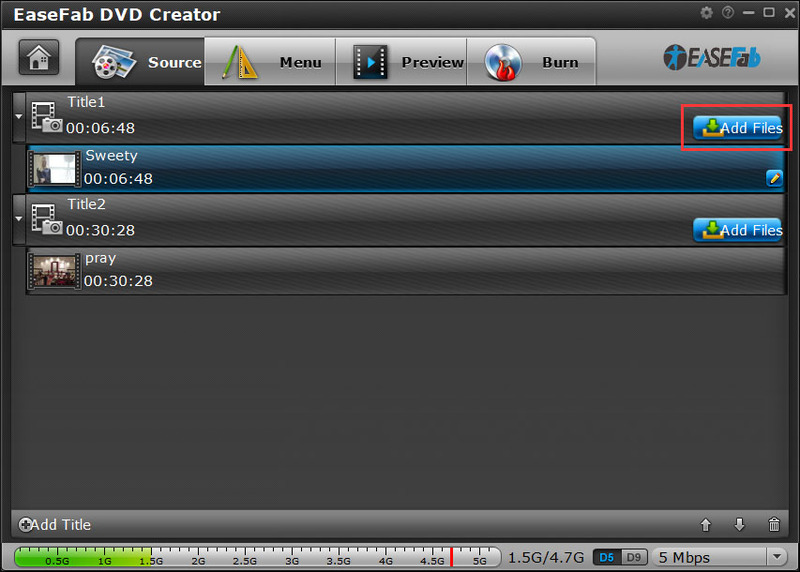 This tool features more advanced functions to make your DVD creation more fancy and stunning than DVDStyler. You can give full play of your creativity and imagination with DVD Creator. Now you can download the trial version below for taking a try. Any problem, contact with our support email. Note: The trial version only allows you to 3 times to burn your videos to DVD/ISO image files or DVD Folder. If you're satisfied with the tool, you can purchase the full version to get rid of the limitation.